Share the post "Travel Guide: San Sebastian, Basque Country, Spain"
Known for its gorgeous beaches and top-notch food, San Sebastian is definitely a must-visit city in Spain! I was dying to visit Basque Country, and when a 4 day weekend came my way, I decided to take advantage of it. I had heard so many amazing things about San Sebastian in particular that I decided to spend two of my days there, and I wasn’t disappointed. You could easily spend a week here! Just expect to gain more than a couple pounds… But I promise, it is worth it. I loved it so much that I returned two years later with my husband! And I’m already trying to plot my next visit. Where is it located? It is located on the north shore of Spain, in Basque country. It is very close to the French border. What language do they speak? They speak both Spanish and Basque (a language with no known linguistic relatives). For helpful Spanish phrases, go here. To improve your language skills, check out my useful tips to learning a language on your own. What currency do they use? They use the euro, just like in the rest of Spain. It is the capital of the Spanish province, Gipuzkoa. The city was completely destroyed except for one street during the Peninsular War of the early 1800s. 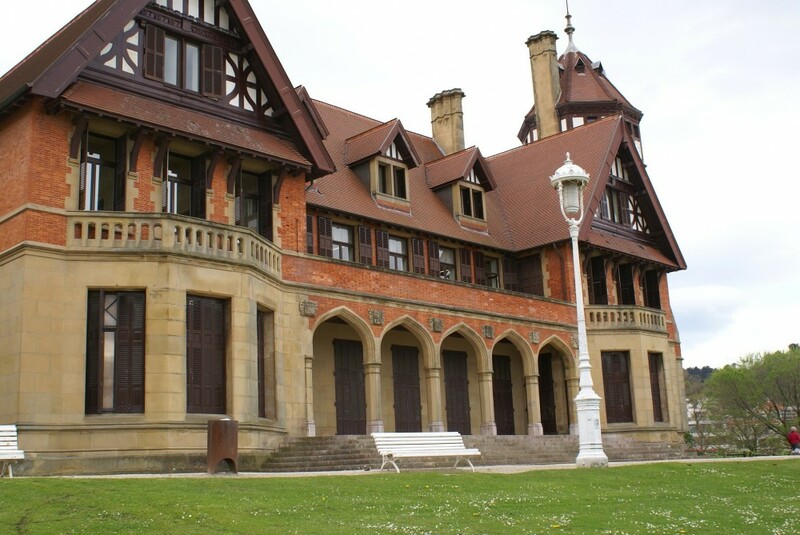 It became a popular holiday destination for Spanish royalty in the late 1800’s. Depending on where you’re departing from, you have many options for arriving to this lovely coastal city. On my first visit, I opted for the bus (for financial reasons – see more info below) from Barcelona. To compare your various options based on your location, I recommend using the website Rome2Rio. There is also an airport and train station, so you have many options at your disposal. From Barcelona, it was about an 8 hour bus ride. Sounds like hell, doesn’t it? I took it overnight, hoping to get in some Zzz’s before exploring the following day. Even with melatonin, it was nearly impossible. It didn’t help that there was a crazy guy on my bus who thought he had boarded the party bus, and started playing music loudly on his phone and fist pumping the air. Now, why ever would I put myself through the torture of taking an 8 hour bus overnight there? Because it was much cheaper than both the train and a flight. Plus, I wanted to challenge myself. Now I know that I can do it, I just might consider not doing it again in the future. The train was the next cheapest option, but it would have still taken at least 6 hours that way. I decided not to fly there because airports are awful, by the time I got to the airport and had to wait for my flight, the time wasted probably would have been similar. My friends did end up flying there and meeting me, but they also paid twice as much and didn’t have as much time there. Another problem with taking the overnight bus, however, is that it arrives ridiculously early in the morning to San Sebastian. We arrived at about 5am, and what can you do that early in the morning? Nothing. Nowhere was open, including the hostel I was going to be staying at, so I decided to just wander around with my luggage. I ended up on Zurriola Beach (yes, with my luggage) and watched the surfers come one by one to take advantage of the early morning waves. For up-to-date information on the bus routes and fares, go to the official airport website. There are always taxis waiting out front, and if you’re a small group of people are are carrying a decent amount of luggage, a taxi may be the better option for you. The rate depends on the time of day and distance. For more information, including minimum fare rates and waiting time charges, click here. The airport has all of the major rental car companies. For more information, visit the official site. San Sebastian is pretty small, so pretty much anywhere you stay, you will probably be within walking distance of all of the important places. If you’re on a budget like me, hostels are a good way to go, but be sure to book ahead of time! Even though I booked a few weeks in advance, there were very few beds left. I stayed at the Surfing Etxea Hostel, and enjoyed my stay. As the name implies, it is catered towards surfers and even allows you to rent out boards and gear. It is also only a block from Zurriola Beach. I met a lot of really nice people there, and the facilities were clean. My only complaint is that the employees there were always gone. If you were trying to check in or check out, for instance, you might have to wait awhile because they were often out walking their dog. One guy had to give up his 20€ deposit because he had to catch a train and the employees were nowhere to be found. There are also various hotel and Airbnb options. For advice on what type of accommodation to choose, read my article on How to NOT Spend Your Life Savings on Travel Accommodations. Playa de la Concha – lovely, where most of the tourists go for a nice beach day. Monte Urgull – the hill to the right of Playa de la Concha, with a statue of Jesus at the top. A lovely walk, give yourself a couple of hours and bring some comfortable shoes. Free museum at the top. 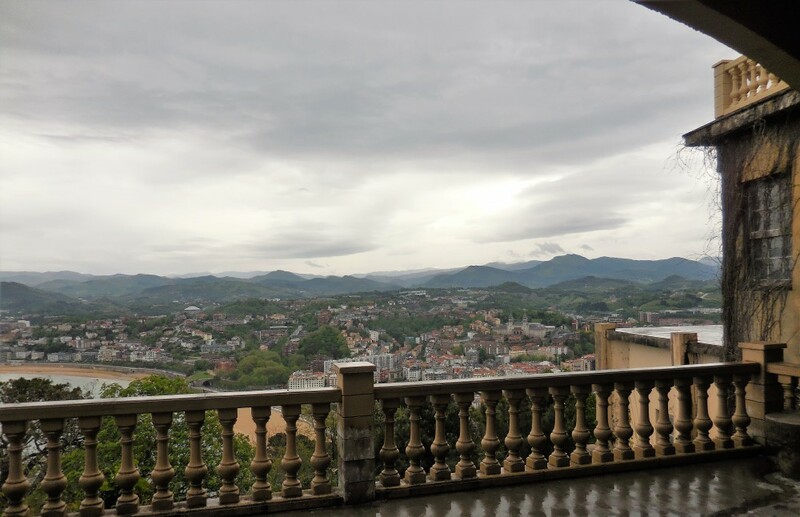 Amazing views of San Sebastian! Parte Vieja – neighborhood at the base of Monte Urgull, this is where you will find all of the amazing pinchos places. 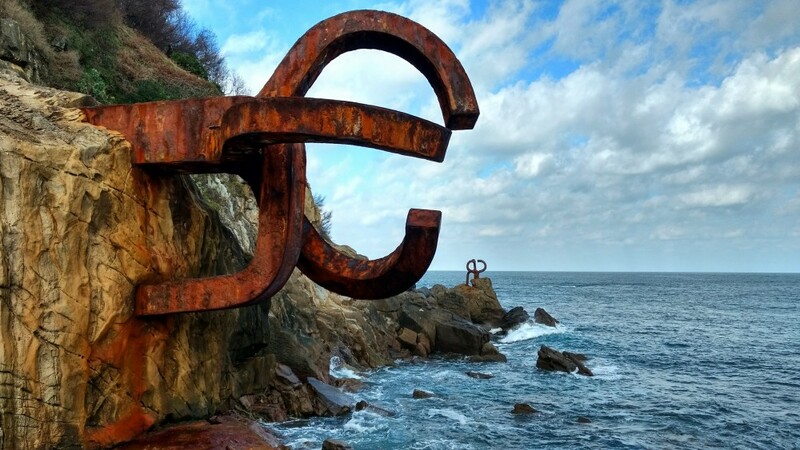 Peine del Viento – translates to “Comb of the Wind.” This is a sculpture by Eduardo Chillida, located along the waterfront near Monte Igueldo. Beautiful to visit on both sunny and stormy days, sometimes the waves and wind cause noises in a system of holes in the ground. Zurriola Beach – Lovely, less crowded beach for surfers. 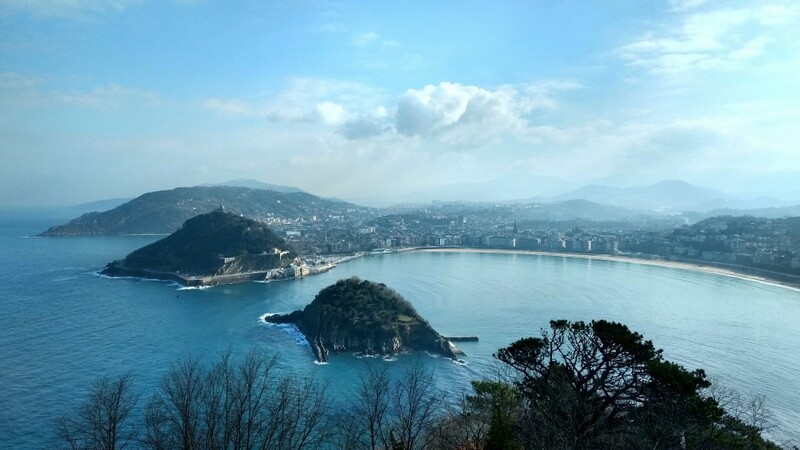 Monte Igueldo Teleferico – Take the funicular up Monte Igueldo for some amazing views of San Sebastian and the bay. There’s also a small theme park at the top. Only costs about €3.15 to go up and then back down, but it costs extra for the rides. Miramar Palace – A palace located in the center of Playa de la Concha, that dates back to the late 1800’s, built for the Queen of Austria. Nowadays you can visit the surrounding gardens and have beautiful views of the bay. Ayuntamiento de Donostia San Sebastián – pretty city hall in the center of the city. Basilica of Santa Maria – Baroque style church from the 18th century, located at the foot of Monte Urgull. Alderdi-Eder Park – Lovely park for all ages, to the eastern side of Playa de la Concha. Plaza de la Constitución – beautiful to people watch and have a drink, used to be an old bull ring. Pasai and Pasaia – Fishing villages nearby, where you can wander the charming streets and take a boat ride. Parte Vieja (Old Town) The old part of town is where it’s at. See the above map? I starred all of the major things that I wanted to see/do, and the majority are all clustered in that central part of Parte Vieja. Granted, the majority of the things I wanted to do involved eating, but still. That’s pretty important business when you’re in San Sebastian. Now, there are good pinchos. And there are meh pinchos. It is important to do your research so that you can avoid the latter (or take advantage of my research and use the interactive map above)! All of the businesses in this area know that tourists are coming for the food, and they often put together cheap ingredients with a slightly inflated price and try to convince you it is legit. It isn’t, don’t fall for it! Another thing to keep in mind when going for pinchos is that most of the (legit) places do not have much room to sit down. The typical pinchos places are very small and require you to crowd around whatever little counter space is available, so be prepared to stand for awhile! The beer helps, I promise. My friend and I were super hungry after walking around for awhile, so we just stopped inside one of the first places we came across. 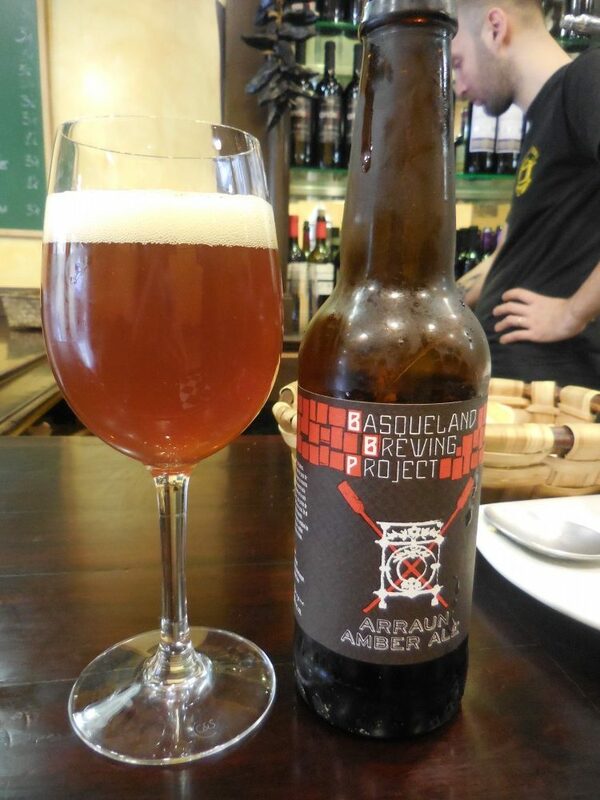 This was San Sebastian, it had to be good, right? Wrong. The flavors were very bland, and everything was just a bit too fried for my taste. And the beer was more expensive than it should’ve been. One red flag for this place was that it was rather big and had a decent amount of sitting space. I think this is a pretty good indicator that it is more corporate and geared towards tourists. 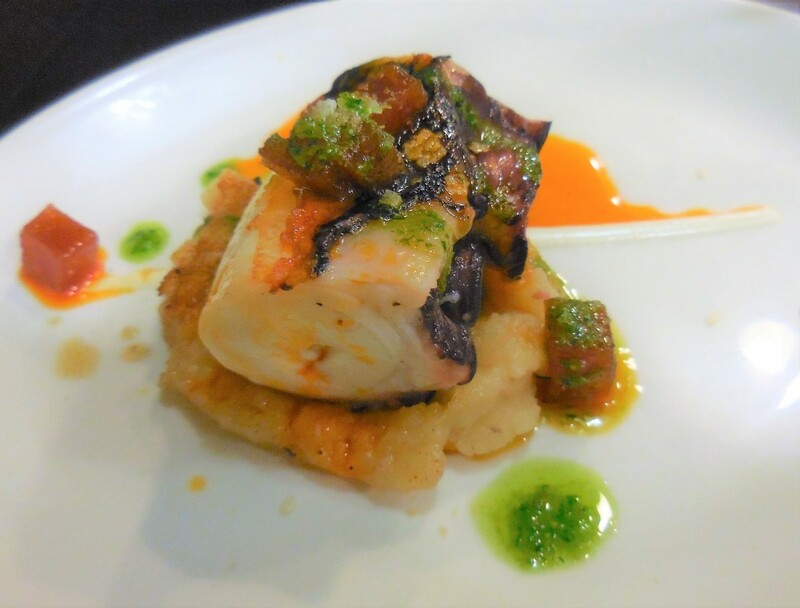 Our bland, not so bueno first pinchos… Don’t go there! After that disappointing experience, I looked to my list of recommended restaurants and we decided to heed the online community’s advice. 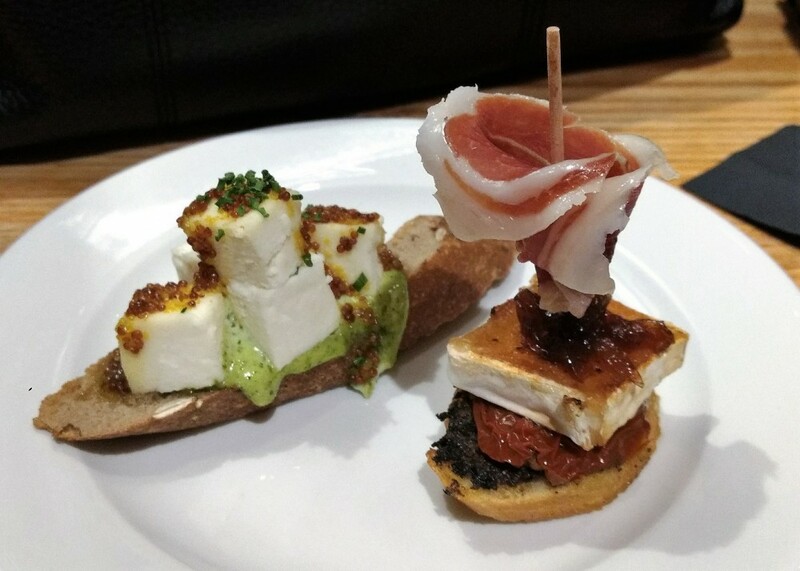 We headed to Borda Berri, which had shown up numerous times in my research as being the best pinchos bar in San Sebastian. When we were at the hostel, also, I overheard some people talking about how amazing it was. When you enter, it is surprisingly small and it can be a bit overwhelming when it’s crowded. Luckily we came at an off-time, so there was plenty of room at the counter. They have a chalkboard with all of their specialties of the day, and pretty much everything there is fantastic. You can’t go wrong, just keep an open mind! 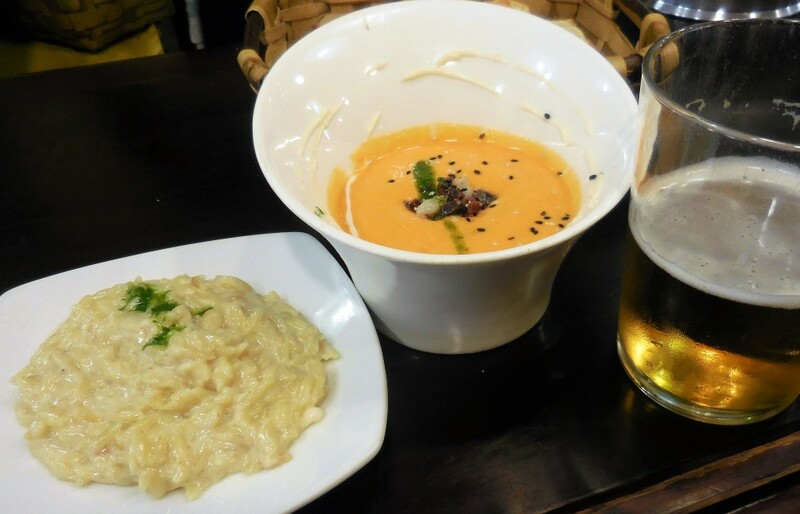 I had heard that the gazpacho (on the right) was great and I chose the mushroom risotto (on the left) as a second. My friend loved the gazpacho, but it was a little too strong for me. The risotto was tasty as well. However, I think I played it a little too safe here. I ordered what I knew. As we were eating, we met two lovely ladies from Canada. People are so friendly here! They recommended that we try the local beer (we were upset we hadn’t noticed it before), and it was absolutely delicious. They also recommended us two other dishes that we returned to try the next day. I went out of my comfort zone and ordered the octopus and ribs, as recommended by the girls we had met. It was AMAZING. I had tried octopus before, but it had just been meh. This was on another level entirely. It was so delicious, I found myself closing my eyes and savoring every morsel. It was perfectly cooked and practically melted in your mouth. All of the different sauces perfectly balanced with the delicate taste of the octopus, I was tempted to order a second. The ribs were also amazing. It was super tender and full of flavor, and all of the sauces along with the flakes of sea salt were just too perfect to describe. You will not regret ordering this! And it is a little more in the comfort zone for most people. My friends ordered the gazpacho again and then also tried the stuffed tomato, which they said was delicious. But I don’t think they loved it nearly as much as I loved mine. Borda Berri is a little more pricy than the other pinchos bars, but it is worth it… I swear. When I returned 2 years later to bring my husband, this bar was closed for holidays… and I was absolutely devastated. Do not miss this place! Nearby, there is a quaint and lovely square called Constitución Plaza. It is lovely to walk around and there are also many restaurants and pinchos bar surrounding it, but everything we saw there didn’t look too great. Be forewarned! Go for a quick stroll, but not really anything else. The buildings are really lovely. 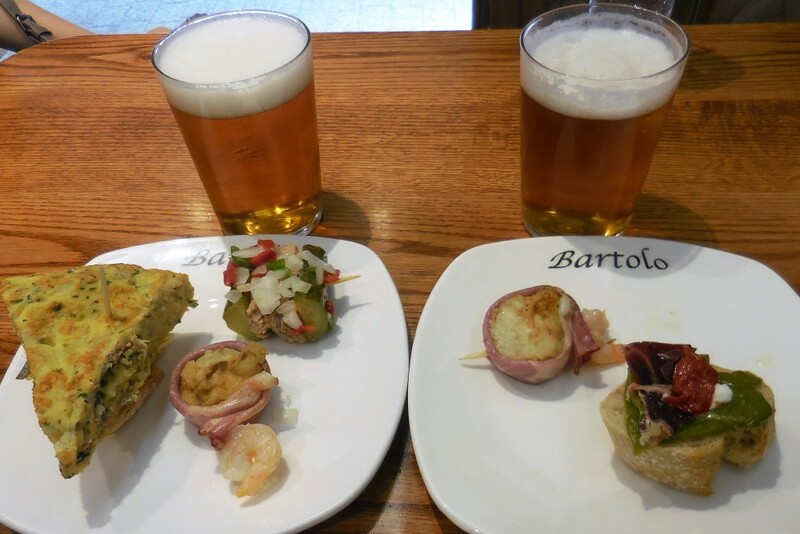 Nearby, there is a lovely pinchos bar that came highly recommended to us called Taberna Gandarías. 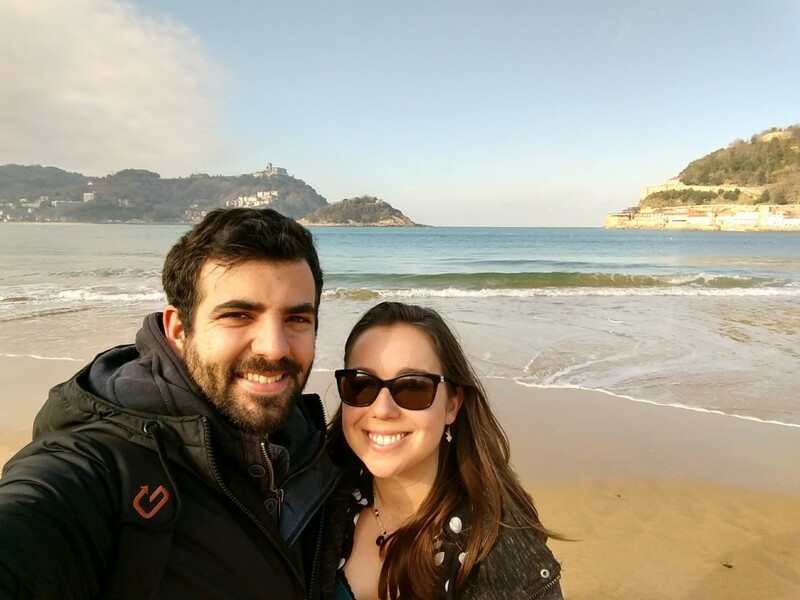 One of my colleagues told me that while she was in San Sebastian for 3 days, she went there 4 times… do the math! We were only able to make it once, but we were very impressed by the pinchos. There isn’t much space, and this place in particular had quite a lot of people crowding the counters. Oh, and there’s very little counter space as well. But the prices on tapas and wine are fantastic, and it is definitely worth checking out! Just expect to wait a bit before they can assist you. My friends were super impressed with Gandarias, and I enjoyed it too… But honestly, Borda Berri topped my list for the entire trip. On the last day, we decided to try something new that wasn’t on my list. We ended up at La Montanera Kota 31 (I think it has since closed down), which despite breaking some of my rules, turned out to be fantastic! When we entered, there weren’t many people there and there were lots of places to sit. Normally a red flag. But literally everything we tried here was amazing, including the house wine. We had about 4 pinchos each (totally against the rules for a pinchos crawl, but our feet were tired and we had a table!) and an equal amount of wine, because the wine was actually one of the best ones I have ever tasted. I highly recommend this place if its still there! Another thing, and this is important: ask the staff at your accomodation if there is anything special happening during the days you’re there, or if there are any pinchos specials. We found out that the Thursday we were there, near Zurriola Beach and along Gran Via Kalea they were doing an amazing special: 2€ for 1 pincho and one drink of your choice. Is that amazing… or amazingly amazing?! Many pinchos bars around that area were participating, and everywhere was crowded. But it was so worth it! Some of the pinchos were just alright (I mean, you can’t expect much for such a cheap price), but some of them were absolutely delicious. If there’s something similar going on while you’re there, efinitely take advantage! But be careful… it tricks you into drinking more than you probably should… if you can’t resist trying every delicious-looking pincho, like us. On the far side of the Parte Vieja is Monte Urgull, one of the two main large hills in San Sebastian. You can climb up this for some lovely views of the city, and can also visit the large Jesus statue at the top. There’s a free museum you can enter, but it didn’t prove to be all that interesting (in my opinion, and I’m not big on museums to begin with). But the views from the top are worthwhile! It isn’t too difficult of a walk, but in the heat, you will definitely start sweating a bit. Dress accordingly! Good thing is, after your hike and working up an appetite, you have loads of pinchos at the bottom of the hill to look forward to. Give yourself about two hours to walk around and explore. There are many different paths that lead to the top, and the occasional bench to take a rest. You will be awarded with some gorgeous views! Don’t miss it. A peek at Monte Igueldo across the bay. Also worth the visit! 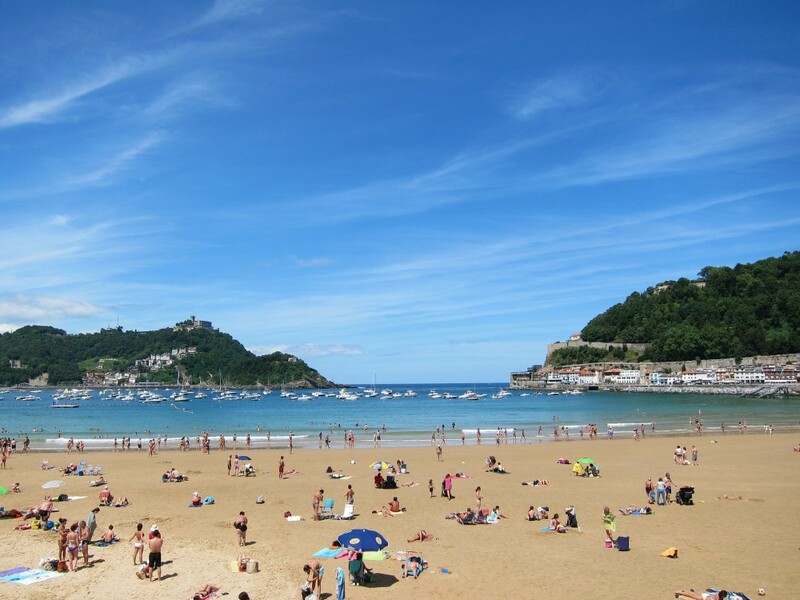 Now, San Sebastian isn’t really known for its beaches in the way other places in Spain are. However, they are lovely and worth a visit! 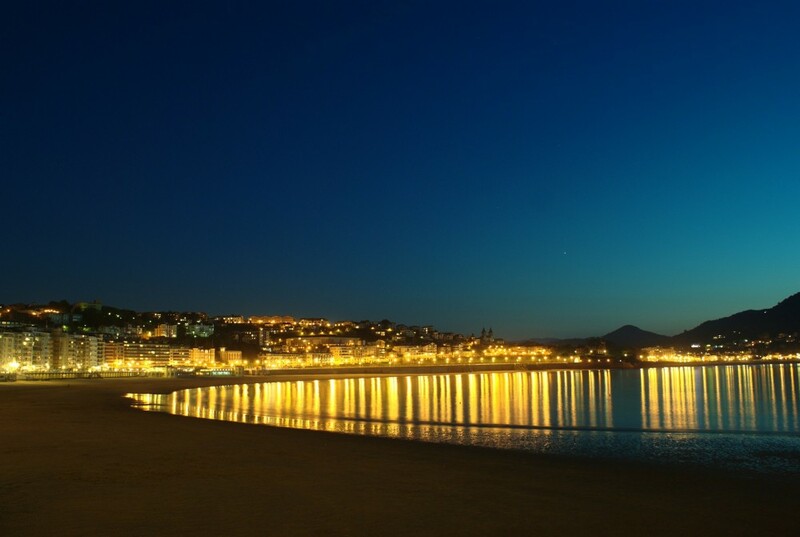 The two main beaches are Playa de la Concha and Playa Zurriola. It is important to know that the North of Spain (or Basque Country, excuse me) rains quite a bit, which is why everything you see is unbelievably green. It did sprinkle a little bit while I was there the first time, and the people we spoke to at the hostel said it had rained all that week. But it doesn’t take away from the beauty, and hey, you can just run into a pinchos bar to ride out the rain! If you continue walking along the boardwalk towards Monte Igueldo, you will find many places where the beach disappears and there’s a cliffside instead (depending on the time of day, of course). There are also plenty of places to sit on the rocks to enjoy the waves crashing against the shore. At one point, you’ll come across a little underpass with a pretty building on top and a pretty green garden. You can take the stairs up and picnic there, it is a lovely place to rest and take in the views. The name of the place is Miramar Palace. On the other side of this underpass, you will find the other half of Playa de la Concha. Unfortunately, we didn’t actually make it to the beach during our trip. We were too busy stuffing our faces with pinchos, and probably wouldn’t have looked too hot in a bikini after all of that anyways. But even with the clouds, it was quite warm outside and a few hours later the sky cleared up and it was lovely! This picture below was taken the same day, just about an hour later. Depending on the time of year, the sunset may be blocked by the hills surrounding San Sebastian. But the views on the beaches are lovely nonetheless at night! On the other side of Playa de la Concha, farthest from Parte Vieja, is Monte Igueldo. You have the option of walking up (expect a decent walk), driving up, or taking the funicular up. For the funicular, it only costs about 3€ and includes admission into the mini amusement park at the top (but going on the rides is extra). The funicular going up Monte Igueldo. 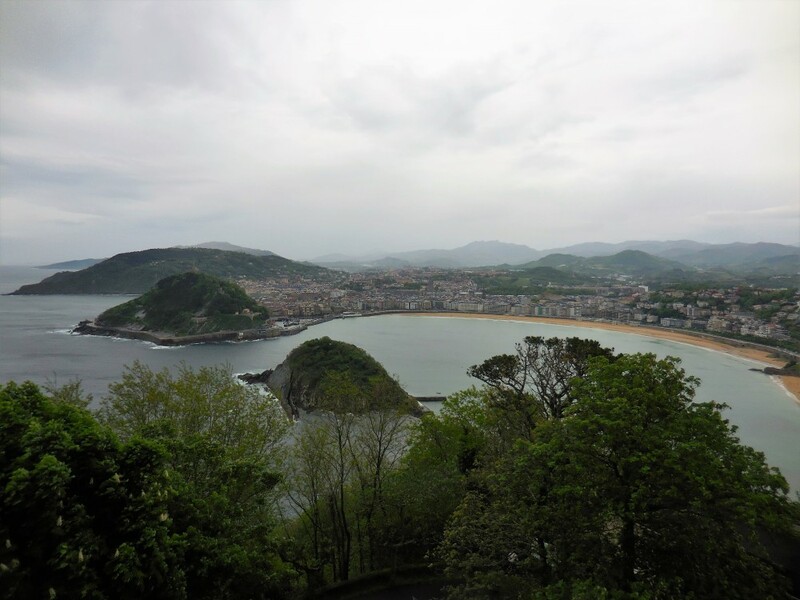 Once at the top, you have some breathtaking views of San Sebastian. I’m pretty sure all of us literally gasped at just how beautiful it was, even though it was sprinkling at that time. It is definitely worth the visit! We came across this cute little boat ride that went along the mountainside, and we just had to try it out. The boats are super small but can fit 4 people. It was about 2€, which was a little pricy considering how short of a ride it was, but it was still fun. There are many other rides there as well, which would be fun for the young ones on a sunny day. However, it isn’t the greatest amusement park in the world and it’s rather pricy. I noticed they also sell beer, wine, and pinchos up there as well for the adults! On the other side of Monte Igueldo, facing away from Playa de la Concha, you can get a sneak peek at the coast. It was so gorgeous, I wish I could’ve just rented a car and spent days exploring all of the small towns along there. It is beyond beautiful in Basque Country. The fishing villages are to the right of San Sebastian. Nearby San Sebastian, there are two little fishing villages on the bay. It is popular to go hiking there and take a stroll. We were feeling lazy, however, and didn’t have much time anyways, so we just took the bus. We had google maps at our disposal to figure out the buses, but if you don’t have that just stop into your nearest tourist information point and they’ll give you a heads up. It took us about 25 minutes by bus to get there. There isn’t a whole lot to do when you’re there, but it is very beautiful and old-European looking. It doesn’t even feel real as you walk along the small cobblestone corridors. There are little restaurants and ice cream shops all along the way that you can stop at for a rest (especially if you decide to do the hike, which can take anywhere from 2-4 hours depending on your pace). There’s a small boat that you can ride to get to the other side, at a cost of only about 70 cents per person. It is very quick, but a fun experience nonetheless. There seemed to be more to see and do on the Pasai side, so keep that in mind! If you’re looking to save money, it could be a good idea to pack a picnic lunch and eat along the waterfront. I honestly didn’t know much about Basque people before I left for this trip, and I still don’t. But here are the basics: Basque Country is NOT Spain. Do not talk about Spain here. They have their own very distinct language and are very proud of their culture. In the recent past, there was a terrorist group here called ETA that fought for the independence of the Basque Country and harmed many people. Today, it is safe to visit, but please be respectful of their culture and wishes to be independent! Of course, everyone there also speaks Spanish, so you can get by using your basic Spanish phrases. While we were there, we saw a protest march go through the streets. It was very calm, but later we noticed that there was graffiti placed around some prominent places, and it was such a shame to see that they felt the need to deface private property… but oh well. I am very much intrigued with San Sebastian and have wanted to visit for a while now! I didn’t realize they spoke a dialect which has no relatives! I definitely would like to try the pintxos! Thanks for linking up with #TheWeeklyPostcard! Oh this was it! I knew it felt familiar! I love San Sebastian. So much to do and the food there is amazing. We did have the steak at Bar Nestor and it was delicious. They are also known for their tortilla but that was sold out by the time we got there. Always a pleasure to read about Spain. 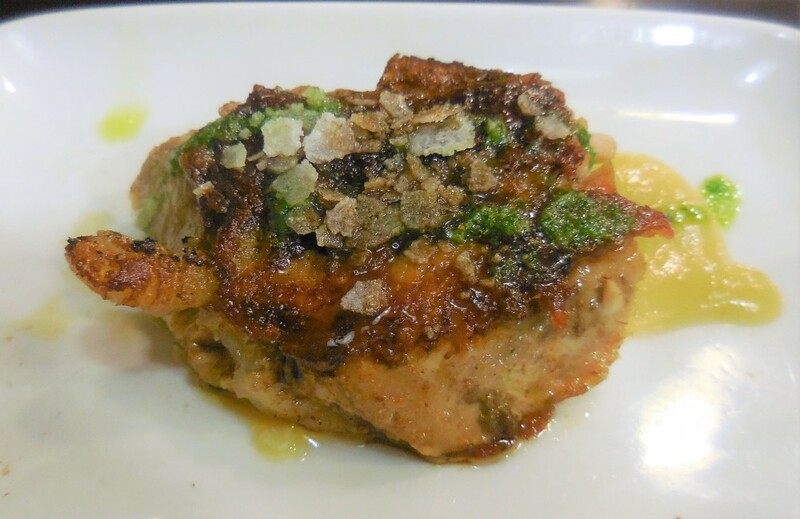 We’re big fans of the food, as well as the wine and cider of the Basques. We’ll get there someday, but posts like yours help bring us closer! Thanks for sharing on #TheWeeklyPostcard! I visited Basque country briefly a few years ago and fell in love with the area. Cannot wait to return and explore. Which cities did you visit? It is so easy to fall in love with the area! San Sebastian is a place I have wanted to visit for quite some time and this post has tempted me even more. I have visited Saint-Jean-de-Luz which is just across the border in France Basque region and that was also lovely. Thanks for sharing this amazing guide about Sebastian tour, This is really very helpful article for those travelers who thinking to visit Sebastian. the coastal city of San Sebastian has risen from a modest fishing village to a trendy international getaway. Great Post keep sharing. Yes, for a couple posts I have, but I’m trying to find an easier way! Just starting to learn 🙂 I hope you get to visit soon, I’m dreaming about returning myself!